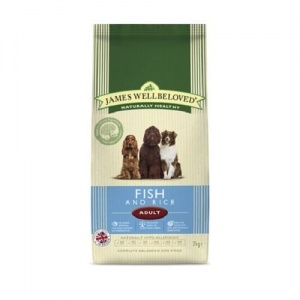 The natural wholesome ingredients in James Wellbeloved Fish & Rice are hypo-allergenic, easy to digest and delicious to eat. Made with white fish only which is low in histamine and smothered in delicious olive oil. Peas and chicory provide the necessary dietary fibre and includes linseed oil and fish oil high in omega-3 fatty acids for a healthy omega-3 / omega-6 balance. James Wellbeloved fish and rice dog food contains none of the ingredients that can cause most food allergies (i.e. no beef wheat or dairy products). Hypo-allergenic to soothe skin irritations. A wholesome natural hypo-allergenic dog food. Ocean white fish meal; rice; barley; whole linseed; olive oil; vegetable gravy; peas; fish oil; alfalfa; natural seaweed; chicory pulp; sodium chloride; calcium carbonate; DL-methionine; lysine; hydrochloride; threonine; zinc methionate.